I also watched with my daughter “The Book of Life,” which deals with the same idea on celebrating the departed, not fearing them — and also how the only way to really be gone is to be forgotten. This year we lost my Grandmother, or as we called her, Muty. So we decided to give her and my Grandfather center piece in our altar, as she very much wanted to be reunited with him. 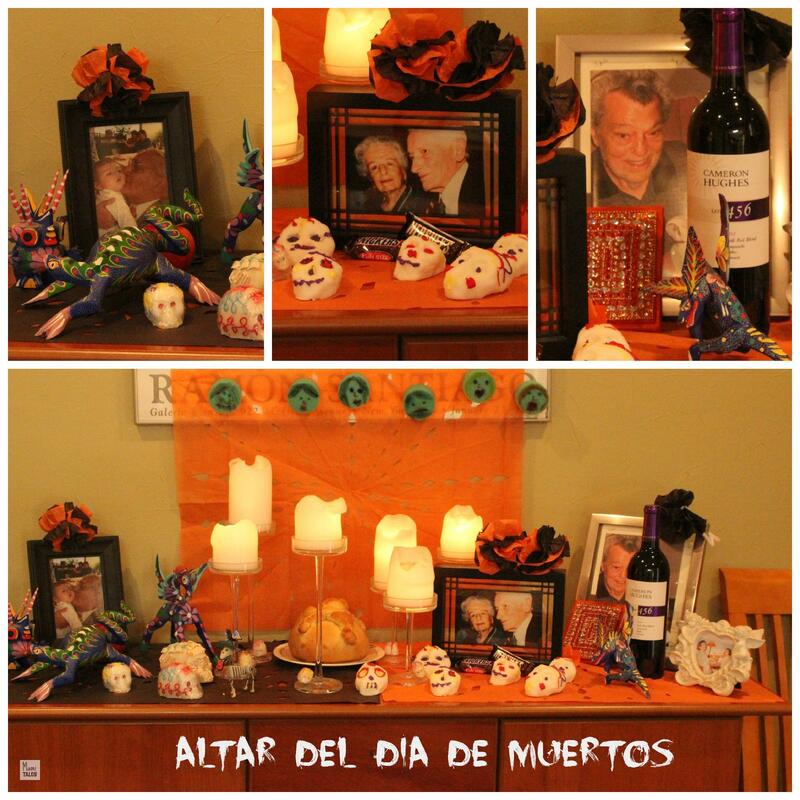 Here’s a picture of our altar this year. Little Miss I and I worked hard on making most of the elements of the altar together. We baked our Dia de Muertos bread, we made together Sugar Skulls (and also bought some at Olvera St. in Downtown LA), we did the papel picado and the Cempazuchitl tissue paper flowers. Little Miss I also found some green foam circles and decided to paint the faces of our honored dead in them. 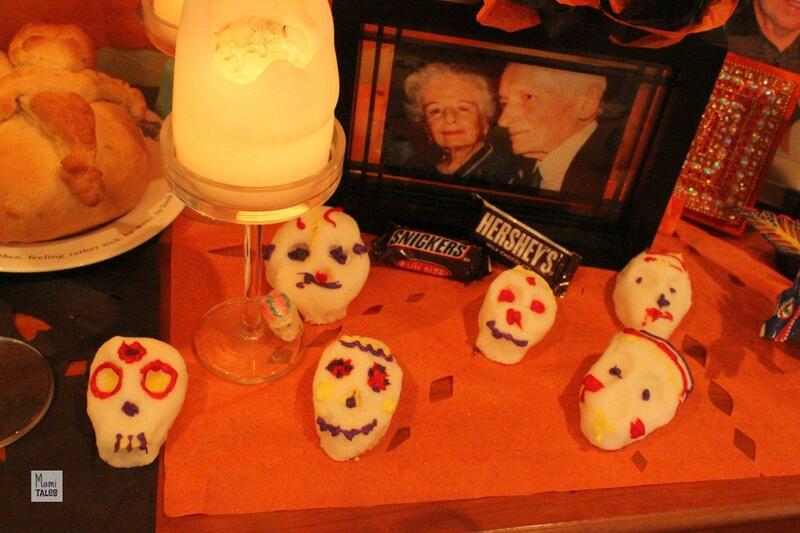 These were our home made sugar skulls. We bought the kit to make them (link above, but ended up modeling the sugar with our own hands, as the mold was impossible to use. She also collected information on what their favorite things to eat were. For my Grandpa Armando we put an apple, as one of my clearest memories when I was a child was seeing him peeling apples with a pairing knife in a spiral without breaking the skin. For Mutty and Vaty we set chocolate. For Gino we set a bottle of red wine, as he was a collector in his latter years. Having this day has been a great help for Little Miss I to deal with the loss of her great grandma. It is a beautiful way to teach her my traditions and also honor the memory of all those we love and have lost. Happy Dia de Muertos! Tagged Child's grief, Family, Inspiration for Kids, Mexican cooking, mourning. What a beautiful altar and even more beautiful story! The sugar skulls turned out so nicely! It is so good to keep the memory of our loved ones alive. I know they’re still around – we just can’t SEE them! I’m sure they enjoyed their treats! I’m sure they did. My daughter kept saying today in the morning that she was certain there were nibbles in them! I love the meaning and ways of commemorating this holiday. Living so close to the border in San Diego, we are in a very diverse area. My son’s school decorated sugar skulls on Friday and I love that he’s learning so much about other cultures! So glad you love the cultural enrichment 🙂 I do too! 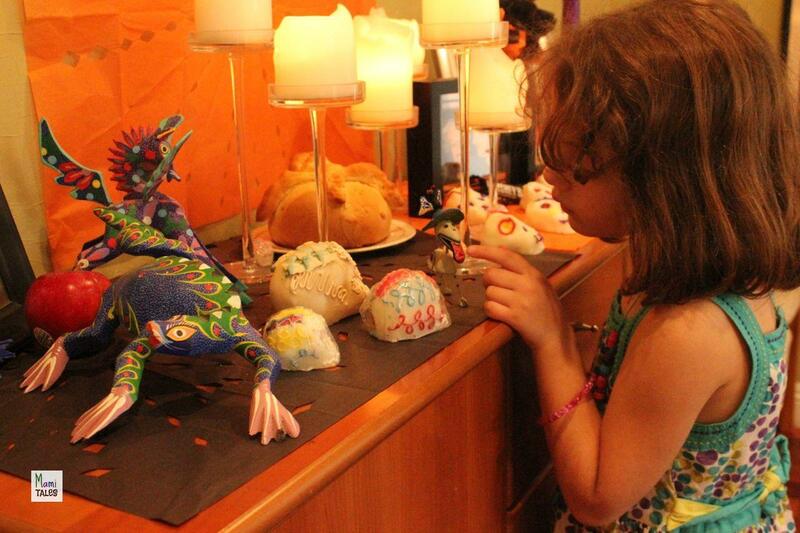 Decorating the sugar skulls with my daughter was particularly fun.